There were maiden season victories for both Paul di Resta and Andy Priaulx over the weekend to boost the pair's seasons. 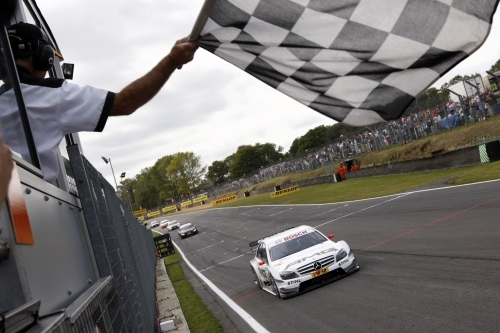 Paul di Resta put in a dominating performance at Brands Hatch yesterday to take his first DTM victory of the season. The BRDC Full Member lead throughout the race in his Mercedes, but was lucky not to get caught by Timo Scheider as two restarts cut his lead right back. Garry Paffett just managed to hold on to fourth place while fellow BRDC Full Member Oliver Jarvis was eighth. Jamie Green finished the race in 12th. Andy Priaulx stormed to his first win of the season as the world Touring Car Championship headed to Oschersleben over the weekend. The Guernsey driver’s amazing start gave him a good chance to battle for the lead, having started the race from row seven, but with Alex Zanardi and Augusto Farfus tangling, Andy was able to take advantage and move up through the field. From there he passed Tom Coronel and Rickard Rydell before taking charge over Gabriele Tarquini for the lead on lap six. From here there was no stopping the BRDC Full Member and he held on for the victory. Andy’s return to form continued in race two as he secured his second podium of the day to grab second place behind team-mate Augusto Farfus. Fellow British driver and BRDC Full Member Rob Huff finished race two in ninth. There was an all BRDC podium in the second Formula 3 Euro Series race at Brands Hatch yesterday as BRDC Rising Star Brendon Hartley took his first ever victory in the formula ahead of Full Member and Superstar Alexander Sims with Sam Bird rounding off the rostrum places. Sam had looked as if he might secure second, but his Mucke Motorsport team-mate, Alexander managed to get the better of the 22-year-old. Race one on Saturday which was run over a split distance after the first attempt was red flagged. The remaining 18 minutes were run later in the afternoon where Alexander just missed out on third place to finish fourth. Sam meanwhile finished the first race in sixth with Brendon eighth.